Tyler Horn had a piece published in 2015 for the athletics-focused publication The Players’ Tribune titled “The No-Star Recruit,” a memoir about his experience trying to be recruited to a college football team as a self-described no-name player. In football, high school players are rated on a 2 to 5-star system. “As a ‘no-star recruit,’ I didn’t even land on the rating system,” Tyler said. “I was nowhere to be found on Rivals, Scout, or ESPN, the big three sites that monitor recruiting... I receive[d] recruitment mail from schools, [but] I only existed as a name in a spreadsheet somewhere, not in the minds of coaches. I was completely under the radar,” he writes. These “no-star” athletes have to promote themselves to coaches to get off the spreadsheet and into the consciousness of actual coaches. “When I was in the recruiting process, I had to physically mail DVDs and my one-page player profile to coaches,” Van says. “Today, it can all be done online, and you have a lot more insight into the progress you're making with the coaches and schools you’re targeting,” he explains. RecruitRef is “like a LinkedIn for high school athletes,” as Van puts it. 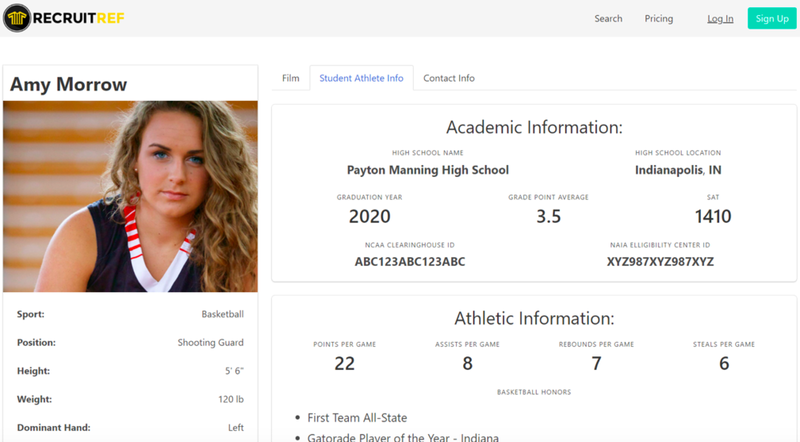 Student-athletes can create a profile to be discoverable by college coaches, as well as send a link to that profile out to coaches and recruiters. This ease of access for both players and coaches means that good players with little attention like Tyler can promote their skills more easily and effectively to make their way onto college teams. The thing Van loves most about RecruitRef? The “self-help model”, as he puts it. “The whole vision is for the platform to enable these kids to pull themselves up by their bootstraps, so to speak,” Van says. “You can use our tools to promote yourself to college coaches and get on their radar if you do the work, and it might pay off big time, just like with sports or academics. I want to help these kids achieve their dreams,” he concludes. To learn more, you can explore the capabilities of RecruitRef here. Van Hatchell received a bachelor’s degree in Entrepreneurship & Marketing Consulting from the University of North Carolina’s Kenan-Flagler Business School in 2011, where he played on the UNC men’s basketball team. He also worked in multiple executive capacities, including Managing Director, for nonprofit Extraordinary Ventures, a social enterprise focused around employing adults with autism. He received his M.B.A. from the University of Virginia Darden School of Business in 2018. Christopher Nelson is a rising second year at New York University in Shanghai, China. He has experience in business operations as well as legal research and contract work. Christopher is currently interning at the UVA Darden School of Business Innovation Lab this summer as an interviewer and journalist. Whipped Cream: Healing And Soothing The Body With All-Natural Skin Care Line "SheaMango"